Claudia grew up on – and eventually managed – her family’s 400-acre Warmblood breeding farm in Bavaria and has dedicated her life to equestrian pursuits. At the age of 5 Claudia started riding and at 16 she began starting and training her own horses. Claudia has a honed ability to identify young horses with particular athletic skill and promise. In 2011, Claudia moved to the U.S. to establish Emerald Hill Farm with the aim of elevating the standard for equestrian nutrition, care and facilities. In the intervening years, Claudia has made many structural improvements to the barns, rings and indoor arena, including adding the finest GGT (fabric and silica sand) footing. With a background in interior design, she has also made a series of tasteful refinements that honor the legacy of this historic equestrian property. Claudia and her husband Niko frequently scout and import German sport horse prospects for Emerald Hill Farm and its clients. Niko von Gumppenberg is an accomplished International Grand Prix athlete and world class trainer. Niko made his Grand Prix debut in Germany at age 16, won his first Grand Prix at age 18 and has also shown successfully in dressage up to level 3. He has extensive experience with starting and training young horses through the Grand Prix level. Over the years, Niko has paired over 80 horse and rider combinations that have gone on to have great success in the show ring. At Emerald Hill Farm, Niko runs the lesson and training program by combining the traditional German riding and training system (training scale) with a modern, confidence-building approach. 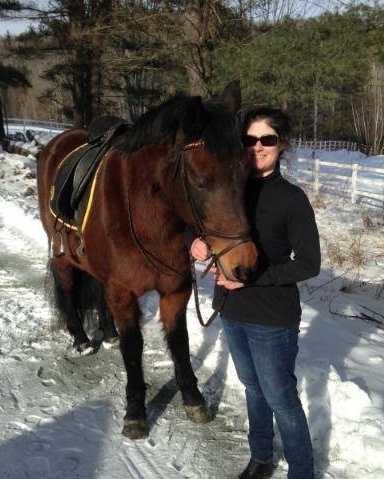 Liz has over 30 years of barn management experience, working at state-of-the-art equine facilities around the country. She has worked with sport horses across a range of disciplines -- from hunters and jumpers, to dressage and racing -- and has assisted with training, breaking and breeding programs. At Emerald Hill Farm, Liz applies her extensive knowledge and insight to ensure that our horses get the best possible daily care. Laurie MacKillop started riding at the age of 11. She attended Johnson and Wales to study Equine Management and was a member of their riding team. Throughout her life she has actively been involved with horses and has been a private barn manager at Emerald Hill Farm for both previous and current owners. Her mare, Flora, a rare breed Lippit Morgan, was born on the premises. Flora has been closely bonded to Laurie since birth. Laurie has successfully trained her and has assisted with the training of other young horses born on the farm. Laurie's love of animals is apparent in her gentle and nurturing manner.